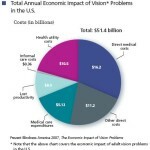 An estimated 1.75 million Americans currently have age-related macular degeneration (AMD). That number is expected to grow to 2.95 million by 2020. * Note that an additional 7.3 million currently at substantial risk for AMD are not included in these projections.